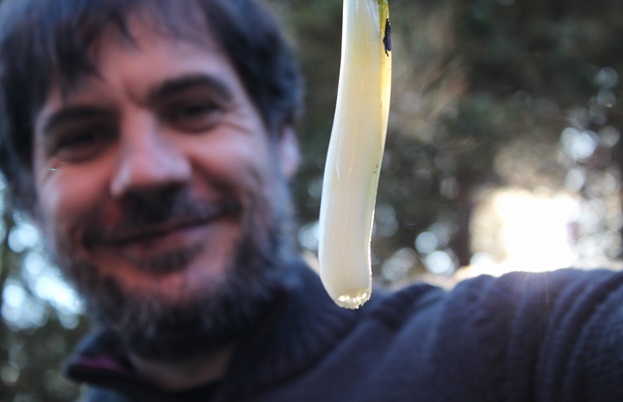 Gemma Marti introduces us to the calçot, a succulent PGI-protected spring onion so popular it has festivals dedicated to its consumption throughout Catalonia. 'The calçot, the porró and castells are three of our things I’ve always been fascinated by. They come out of the earth and make me look at the sky; you have to lift your head to eat calçots, drink from the porró and look at the castells.’ – Bigas Luna, one of Catalan’s most famous filmmakers. Catalonia is home to some of Europe’s best ingredients – amazing pork, the best salted cod, vibrant tomatoes and flavourful olive oil. But there’s one ingredient that’s not as known outside the region which is so loved by the locals that eating it requires an entire social gathering. 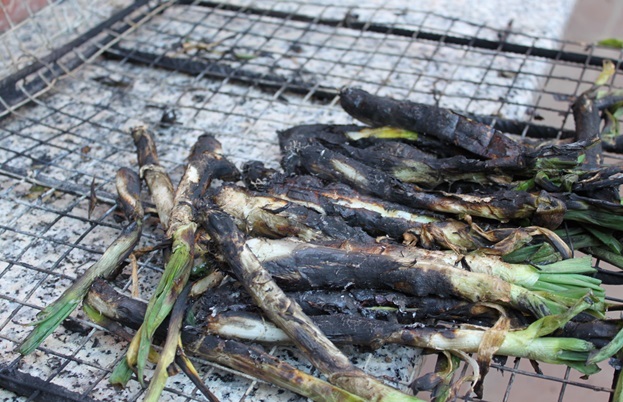 It is the unassuming calçot – a type of green onion grown in the area – that gets Catalans out in their patios, in front of raging fires, eager to dredge the scorched vegetables in sauce before devouring them with their bare hands. Calçots are traditionally from Tarragona, just south of Barcelona, but their popularity has spread throughout Catalonia. They’re grown by gradually building up the soil around the stalk of the onion as it grows (much like Fenland celery in the UK), keeping the vegetable white and stopping it from turning green (an action known as calçar, hence the name). They’re in season from November to April but at their best in January and February, are PGI-protected, and so universally loved by Catalans that huge festivals called calçotades – the biggest of which takes place in Valls, Tarragona – are held towards the end of January to celebrate the little onion. A calçotada can be a social gathering of any size, in the back garden of a family home or in the streets of a major city. My dad organised one in honour of my last visit to Catalonia; he grows the calçots himself and had two crates of the elongated onions to share. They are the perfect thing to enjoy outdoors, and it’s great to be out in the winter sun even when it’s cold, huddled around a fire in anticipation for the feast to come. But while calçotades can come in all forms, there is only one way to eat the calçots themselves. Catalans love cooking on large, open fires, as it’s a very social activity and we love being outdoors – just think of the huge pans used to cook one of Spain’s most famous dishes, paella. 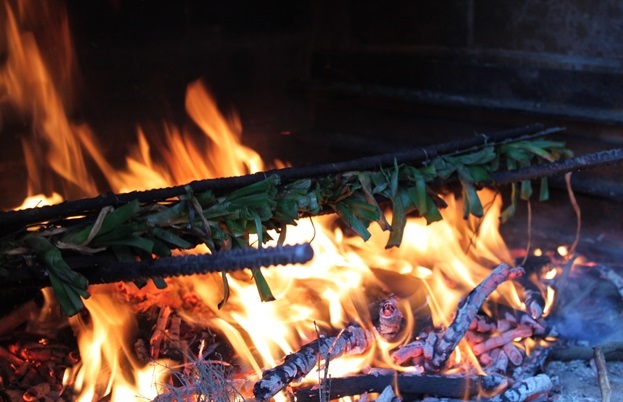 Cooking calçots is no different; we place large numbers of whole onions over the fire and let them char, blacken and cook through, before wrapping them in newspaper and keeping them warm on terracotta tiles. Once they’re cool enough to handle, the onions are unwrapped and peeled, removing the charred skin to reveal the soft, smoky and sweet flesh within. Peeling calçots is trickier than it sounds; you need to pull the skin off from top to bottom in one piece. 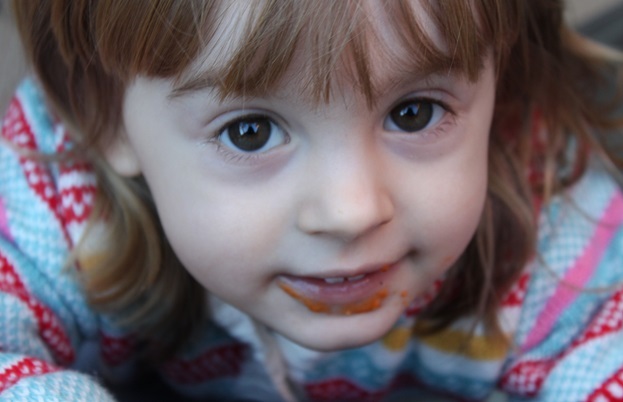 It can get pretty messy, leaving you with black fingernails for days afterwards – if you don’t need to wash your hands at least three times after eating calçots, then you haven’t been doing it properly! 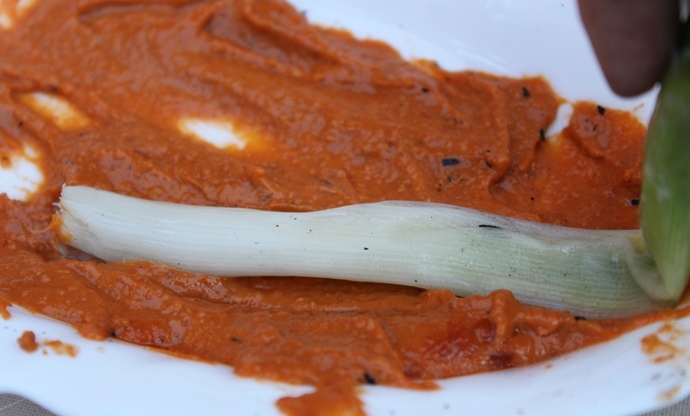 The peeled onion is then dredged in a variation of romesco sauce, a famous Catalan sauce made of red peppers, nuts and olive oil, before being lowered into the mouth from above. 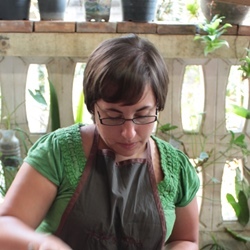 By this point, your hands are covered in char, sauce and calçot juice, which can easily drip onto your front, so it’s common to wear a large bib during a calçotada. We ate around ten onions each at my father’s house, resulting in some very full stomachs, but the feasting didn’t end there. In the brases (embers) of the fire it’s common to cook lamb and botifarra sausages, served with copious amounts of allioli and bread rubbed with tomato and olive oil. 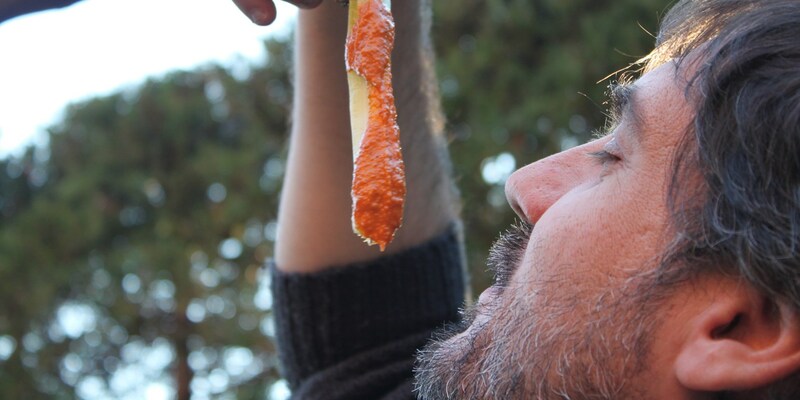 Calçotades aren’t the most elegant of events, but they are certainly one of the tastiest. To make your own sauce for calçots, rehydrate two nyores (a type of dried pepper) and a bixto (a type of dried chilli) in warm water for two hours. Place three tomatoes, five unpeeled garlic cloves, 150g almonds, 50g hazelnuts and four walnuts in a hot oven to toast the nuts and roast the vegetables, then leave to cool. Once cool enough to handle, peel the garlic cloves and tomatoes. Place them in a blender with the nuts, a small bunch of parsley, the nyores (peeled and seeded) and bixto and blitz. Add salt and olive oil until the mixture turns into a thick paste, then add 250ml red wine vinegar. The sauce can be made in advance and actually improves in flavour if kept in a glass jar in the fridge for a few days.